i was. i am. or is it my only sane alibi to keepmyself from succumbing to my weak self again? the self that i wanted to growout of? i could say that i am the lonely type. the type who has so many friendsbut a few to keep. and the type to hide and fetal position on the bed at night. ive been through a lot lately. not as much asthose that got their houses swept away by the storm and not those that lostpeople they love. we all are entitled to our own misery and demise. mine wasfar to WORSE. atleast as of that moment. ive put off writing what i feel for i was busywith my preshift 2 hour overtime and 6 hour restday overtime. i was being aworkaholic. distracted myself with PKs, PID, Windows 7 installation issues andirate customers. to count the days: i was on almost 2 weeks ofpreshift overtime and 2 weekend overtime. i rarely noticed how time paces outas i sat there typing and talking to this customer who can't just get what OEMmeans! pardon the jargon. see post script below. me: im okey. which is weird. i mean. i shouldstill be crying right? the last time i cried was on that unfateful day.that day when things were not clear as it used to be. i went to work last night, barely had enoughsleep. i spent the whole afternoon with a friend. we cooked. got pizza and haddinner. i was about to retract my plotted rest dayovertime only to realize that im saving up for something for my coming 23rdbirthday. so i dragged my lazy bones to work. to find my crush and theannoyance was there. (crush is one being and the annoyance is the other being).was in a good mood seeing the moon waning. i was always a fan of astronomy. hada flair for knowing where orion was and leo and so on. i took the stub, went to the pantry and found theselections quite few. i chose the puto instead. took my juice and rushed to godown. i was ever happy to see that it was raining. 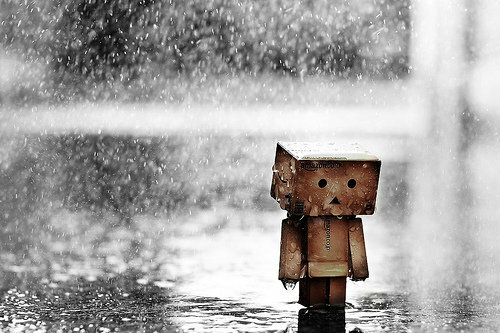 i took a step forward andwalked in the rain - unarmed without an umbrella. people stared. had puzzled looks. who in theirright mind would walk and eat under the rain without an umbrella? i did. ienjoyed it. i have always loved the rain. always wanted towalk with someone. that someone well as of the moment is not with me. he is ithink. but preferred not to be here. i could cry at that very moment. was it ever apropos. the rain. the feeling of thisheaviness and bottomless pit i have here. - points at her heart. yes, i amempty. i will admit it now. i am. void. i was done eating. took my hands out. embraced therain. man, i missed that feeling. relief. coming clean.washed out with all my negative emotions that i hid from everyone. people seeme as someone who is kind, too nice. gullible. considerate. compassionate. andalways happy. i can be sad too. can be miserable. if you ask me what i feel now? the rain cleansed me in ways i can be happy about. i wish it rains everyday. aside from the fact that it lulls me to sleep. i find comfort in the cold raindrops that fallfrom the sky. drops fell on my face. from my eyes - can you distinguish which aretears? i will wait for the ebb of tide. PKs - product keys. its this 25 digit charactercode that one needs to type in to install a software like a password. PID - it is the result of the PK. like itsgenerated once the software is installed and activated. OEM - original equipment manufacturer - softwarelike windows xp are preinstalled on computers/laptop that is the OEM copy ofthe software.." the thing is that the computer company purchased theMicrosoft product that you have and they hold the primary support."